Débarquez votre bateau de croisière au port de Casa Maya et embarquez pour une excursion de trois heures et demie à terre dans l'ancienne ville maya de Chacchoben. Découvrez le site archéologique mystifiant en admirant les pyramides colossales et les temples sacrés qui ont été découverts à la fin du 20ème siècle. Découvrez la faune diversifiée de la jungle environnante pendant que votre guide expérimenté vous propose un commentaire captivant des ruines atmosphériques. Un aller-retour en minibus climatisé est inclus dans le circuit. 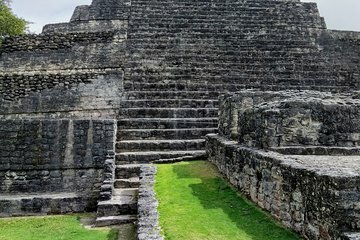 Faites connaissance avec votre chauffeur au port de Casa Maya et commencez votre odyssée archéologique sur les ruines de Chacchoben. Voyagez confortablement dans une camionnette climatisée en sirotant une bouteille d'eau minérale gratuite pendant 45 minutes jusqu'à votre destination fascinante au cœur de la jungle verdoyante. Saluez votre guide archéologue professionnel et contournez le site en expliquant l’importance des temples fouillés de la ville, des pyramides en étoile et des murs antiques. Découvrez les mystères des Mayas en découvrant l’histoire d’une civilisation remontant à la période pré-classique de 200 av. Découvrez comment les fermiers locaux ont découvert les ruines en 1970 et découvrez les techniques archéologiques complexes utilisées pour fouiller les structures. Notez le pigment rouge utilisé pour décorer les temples et déchiffrer les énigmatiques hiéroglyphes à la base de la pyramide principale. Plongez dans la splendeur de la jungle et éveillez vos sens au son de la nature. Identifiez la flore et la faune fascinantes pendant que votre guide partage des connaissances approfondies, écoute et veille sur les singes hurleurs, les toucans, les tatous, les singes-araignées et les renards gris. Asseyez-vous en apprenant la présence à proximité de jaguars, pumas et tapirs. Parcourez la boutique de souvenirs à la recherche de souvenirs spéciaux avant de regagner le port dans votre moyen de transport confortable et climatisé. Nous veillerons à ce que votre retour au port de croisière de la Costa Maya pour cette activité soit effectué dans les délais. Dans les rares cas où votre navire partirait, nous organiserons le transport jusqu'au prochain port d'escale. Si votre navire est en retard et que vous ne pouvez pas assister à cette activité, votre argent sera remboursé. Voir nos termes et conditions pour plus de détails. This shore excursion was truly amazing and so much better than doing the same tour off of the cruise ship. It was a small group of 9 people and was less costly than the cruise ship. I feel like our group received attention that we would have not received on a large tour. Thank you Roberto for an amazing day! Lovely tour with Robert as our guide. The ruins are interesting and you can climb some of them. The paths are flat although a bit rocky. I would recommend close- toed sturdy shoes. The office is NOT in the fabricated "village" at the port - walk past all those tour operators, pool and tourist shops following exit signs to the city. It is in about a block or two outside the village. Viator sent us two emails that stated the tour start coincides with the ship's arrival (7:30 local time on our royal Caribbean ship). Mayan Trips did send their own email about two weeks prior stating the tour was at 9:00 local time. However Viator sent out a reminder a day or two before (we were already on the cruise with no good way to contact them to clarify) stating again it coordinated with the ship's docking. Not wanting to miss it, we hauled ourselves and grandparents off the ship super-early to be there, only to find the tour was indeed at 9:00. They don't leave as soon as a van fills or anything - it is a set time. Viator should do a better job at communicating the correct time to their customers. I think the email they sent is probably a default one but we had no way of knowing. The hour-long wait was not unpleasant as the day was nice and they offered us cold water. Besides that little hiccup, the tour itself was great and we enjoyed our time with Robert. Very knowledgeable and informative tour, water and sodas provided, as well as delicious fresh pineapple on the ride home. Would recommend! After making our way through the cruise portport, we located the tour operator's location just outside the security gates. After signing in and waiting for other travellers, we squeezed into an air conditioned Toyota van. We had to squeeze into the back seat which was not ideal, but our guide spoke to us about Chaccoben on the way. Chaccoben itself was beautiful and was well shaded by the vegetation. Our guide also pointed out some of the trees and vegetation and explained its significance. There was a lot of time for photos. It was a great your of a significant historical site. We were offered complimentary cold drinks, local gum, and stopped for pineapple which made the trip back a pleasant experience. The only thing that could have been better would have been more room in the van but all in all, I am glad we took this tour. We were a family of 9 visiting the port while on a cruise. Finding the location of the tour company was a little challenging. It's important to note that the port shopping area is huge and you just need to keep walking until you get out of the port area and the tour company is on the left right before the gated area. Once we arrived, we waited for another group before departing within 30 minutes. The ride to the ruins takes about an hour. Roberto, our guide, began his VERY INFORMATIVE hour long recitation shortly after departing. It's clear Roberto has done his homework and is very adept at Mayan history. His English was very good and I didn't have any trouble understanding him and learned a lot about the history and culture of the Mayan people. The ruins were great. It's unfortunate they are closed off to climbing, but understandable given the damage that can be done. Roberto continued with his history lesson at the site as we walked along. At the end, we visited the gift shop which also had snacks and tamales available for purchase. On our return, we stopped on the side of the road and Roberto purchased us some fresh pineapple and chili powder. YUMMMOOOO!! Rocky, our driver did a great job getting us to and from the ruins. Thank you to Rocky and Roberto for a wonderful trip! Highly recommend. After the short walk from the cruise dock, we were greeted by friendly and accommodating staff at the tour office. Roberto was very knowledgeable about the Mayan culture, the ruins at Chacchoben, and the local culture as well. Our trip was enjoyable and interesting. After the ruins, we stopped for local fresh pineapple with chili powder, a treat! Beverages were provided in the air conditioned van to and from the ruins. I'm glad we took this tour and avoided a huge group tour and the touristy shops at the cruise dock. Thank you for a great day in Costa Maya. We had a wonderful adventure on our excursion to the Chacchoben Ruins Roberto was our guide and he was so very nice and extremely knowledgeable of Mayan culture and history. We were treated to natural chewing gum like the Mayan's harvested from the trees. We were excited to see monkeys (including a mother with baby in tow) swinging from trees at the ruins and learn about the cannibal tree. We stopped on the trip back by a local fruit stand and were treated to fresh pineapple-Roberto suggested we try them with chili powder and I did and was pleasantly surprised! We also stopped for a one hour beach visit at the Blue Kay Beach and enjoyed a beer and some shopping as well as a beautiful crystal clear beach. This was a lovely excursion, full of fun and we learned a great deal about the culture of the Mayans and the history of Costa Maya. I would definitely recommend you try it! A lot of walking, and climbing if you wanted to. Our guide, Ezikel, was terrific, and he made it very entertaining and informative. ruins are nice and interesting but our guide was the best, great knowledge , nice personality and we had a great time !! !